Boers-Li Gallery is pleased to announce Qiu Anxiong’s first solo exhibition in New York, opening on January 27th 2018 at our recently-launched space on Manhattan’s Upper East Side. 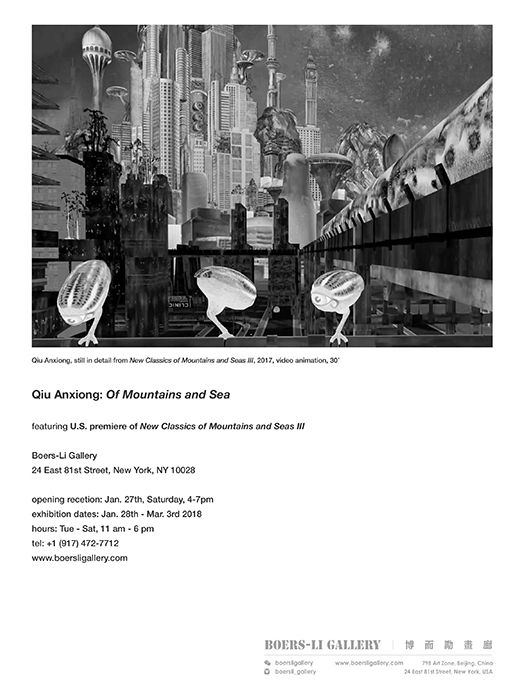 This exhibition, Qiu Anxiong’s fifth with the gallery, will showcase the third and last installment of Qiu’s widely-acclaimed animation trilogy: New Classics of Mountains and Seas (2006-2017) along with related paintings and drawings. The animation’s first episode was shown in 2013 at the Metropolitan Museum of Art in the exhibition: Ink Art: Past as Present in Contemporary China. Later that year, the second episode was presented in Copenhagen at the Arken Museum of Modern Art. This exhibition features the U.S. premiere of New Classics of Mountains and Seas, Part III, which was completed in 2017 and made its debut last March at our Beijing location. Projected onto a large-scale screen, the 30-minute video depicts an apocalyptic future in the post-information age, where the deteriorating environment turns humankind itself into virtual reality. Men and women sit silently playing video games, some dressed as their gaming characters. Animals are re-purposed as mechanical tools – a deer becomes a motorcycle, a shellfish serves as a mask against air pollution. We see a dragon treadmill, lobster VR glasses, a turtle keyboard. This recalls Part I of the trilogy in which sheep evolve into fleshless skeletons; and Part II, in which elephants morph into warring tanks. In Part III, the artist delineates an explicitly political edge: fish eyes serve as surveillance cameras installed throughout the city while devilish-looking men keep watching. The urban landscape is projected onto circuit boards transported on a production line housed in a dark factory. Through the artist’s characteristically trenchant images, polluted air transforms into a toxic sea; towering high-rises mass into distorted mountains, while the once-existent mountains and seas of nature have become a lost utopia. Taking cues from the Classics of Mountains and Seas which offers a historical overview of Chinese culture and geography predating the Qin Dynasty, Qiu Anxiong’s trilogy narrates a multi-layered, “spatialogical” history where pre-modern and contemporary subjects collide. Initiated in 2004, the project spans more than a decade. Part I was finished in 2006, Part II in 2007, and Part III in 2017. In this sense, the social and technological transformation of China during that era is embedded in the work. After completing Part II, Qiu spent six years re-adapting his approach and imagining this last episode. The animation trilogy questions the onrushing progress of social and technological development and their cost to the environment, to traditional values, and to human culture as a whole. A loose narrative ties together Part I and Part II where the world, as described in the Classics, is fundamentally infected by industrialization which leads to climate change and wars over power and territory. Part III speculates on a dystopia where virtual reality is reality and tradition is nothing more than an image. Meticulously structured, each part of the animation is touched off by the artist giving shape to ideas in myriad drawings, which are reorganized into over a thousand acrylic-on-canvas paintings. These, in turn, are individually digitized. The paintings are reworked, sometimes partially erased or painted over, as the narrative unfolds. The result is a multi-media production involving drawing, collage, painting, and video. Such methodology allows Qiu to develop a pictorial repertoire that engenders meaningful symbols. An image of a giant spider crawling over relics of electronic products suggests a concurrence of the prehistoric with a future that has passed, perhaps into the post-historic. Qiu Anxiong interweaves his ink-wash style paintings with the animated world and inserts architecture and signs from Shanghai where he lives, cinematic effects mimicking Hollywood movies, and symbols from pre-modern Chinese ink painting. Anchoring the fantastic with the real world, transferring the past to the present and further into the future, The New Classics of Mountains and Seas offers an anachronic view that regards the material world obliquely. The world, according to Buddhist principles, is, after all, only illusion - the world one knows is the world one creates. Qiu Anxiong is considered a pioneer in deepening the resonance of animation by introducing the aesthetics of ink painting. This approach serves his non-linear narrative which, in Part III, is most evident. Interlacing imagery of the real with the virtual, the animation reflects on the contemporary world where the delineation between the virtual and the real has become increasingly blurred, and the fictional can augment our sense of what is real. His earlier works, including Flying South (2006) and Minguo Landscape (2007), utilize animation in a comparatively straightforward way, employing simplified imageries embedded with an oblique critique of specific historical events, recalling William Kentridge’s animation which left a deep impression on the artist during his six-year stay in Germany. Graduated from Sichuan Academy of Art in 1994, Qiu Anxiong, together with his musician friend Ou Bo (who worked on the soundtrack in Qiu’s animation, Flying South), opened The Little Bar which became a hang-out for local artists and musicians, and gradually fostered an underground music scene. Qiu studied painting at Kassel University’s Kunsthochschule, and returned home from Germany in 2003. Since his return, he has been teaching at the animation department of China Eastern Normal University in Shanghai. In 2007, he launched Museum of the Unknown which functioned as a community, a platform for various kinds of expression as well as an exhibition space, seeking to stir up conversation and discussion about social concerns. Qiu Anxiong has participated in numerous international exhibitions at venues such as: Jeu de Paume, Paris; Gasträume 2014 - Public Art in Zürich; the 54th Venice Biennale; the San Diego Museum of Art; the Serpentine Gallery, London; Espacio de Arte Contemporeáno (EAC), Montevideo, Uruguay; Kunsthaus Graz, Austria; the Museum of Contemporary Art, Tokyo; Big Screen Liverpool, UK; MoCA, Shanghai; the Hong Kong Museum of Art; the Queensland Art Gallery, Brisbane; the Seoul Museum of Art (SeMA), and others. His works are included in several public collections, such as: the Metropolitan Museum of Art, New York; the Museum of Modern Art, New York; the Spencer Museum, University of Kansas, Lawrence; the Oxford University Museum; Kunsthalle Zurich; the Museum of Contemporary Art, Tokyo; the Hong Kong Museum of Art; the Astrup Fearnley Museum of Modern Art in Oslo, and others.